Letters to My Grandma which is currently being performed at Theatre Passe Muraille, is a wonderful play that I thoroughly enjoyed and would highly recommend that you see, (whomever you are,) while you still have a chance to. While I was initially a little sceptical as to how interesting a one person monologue about hatred between Hindus and Muslims in India from World War II to the present would be, I was quite pleasantly surprised by it. 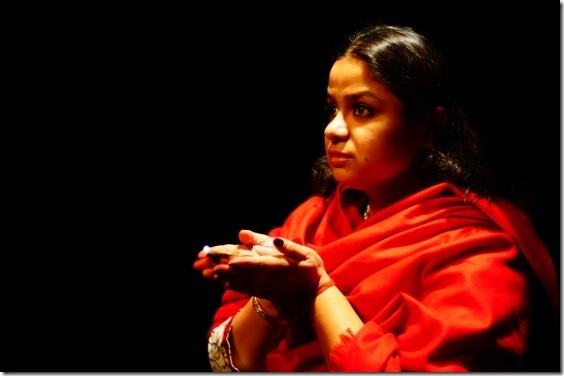 Letters to My Grandma wasn’t a monologue at all, but rather a play in which all the characters were played (quite convincingly and skilfully,) by a single actress, Anusree Roy, who incidentally is also the one who wrote this play. Anusree’s characters include: Malobee (who seems a thinly veiled version of Anusree herself), Malobee’s mother, her eponymous Grandma, her Grandma’s Muslim caregiver, and a couple others. The story begins during WWII, (before the actual partitioning of India and Pakistan into two separate countries in 1947,) but the play shows a country already nevertheless very much divided along religious lines. It’s horrific what Malobee’s Grandma has to do just to survive with her baby in her war-torn country, committing actions that come back to haunt her in her old age. Surviving for her meant pretending to be both Hindu and Muslim at different times, as people seemed only willing to help their own “kind”. Her Hindu Grandma’s experiences during the war and partitioning have made her hate Muslims. While the story begins with a tragedy, the story ends, very much like a Shakespearean or any other comedy, with the prospect of a wedding. Malobee (who has immigrated to Canada from India and now lives in Toronto,) wants to marry Mark, a Muslim who immigrated from Pakistan (whose real name is Muhammad Ahmed). If the play begins with a metaphorical divorce, (i.e. the partitioning of India and Pakistan into two different countries, with two different predominant religions,) the play’s literal marriage of Malobee, a Hindu Indian, and Mark, a Muslim Pakistani, seems to offer up the hope of a peaceful reconciliation between two warring nations that were once one nation. Being somewhat of an idealistic pacifist I love this idea, an end to the hatred that wrought the past, and a unified future, a wonderful message for not just India and Pakistan, but Catholic and Protestant Ireland, and Israel and Palestine as well. Letters to My Grandma certainly mixes both the serious and the mundane, as wars, hatred, and death are found immediately before and after jokes about airline peanuts and long distance calling cards. I’m not saying it lacked the appropriate gravity, but it’s just an odd combination. I suppose it is perhaps all the more realistic because of this mix, since no matter how harsh one’s life is there are always humorous and meaningless moments in it. Though I must admit that I hate jokes for jokes sake, by which I mean just throwing in some humour to make serious subject matter more enjoyable for the audience, which I find a lot of plays today do. I’m not sure whether this production is guilty of this offence or not, either way I still loved it. The person I went to the play with, Angela, actually lived in India during the partitioning and WWII , though has no recollection of these events as she was only a very young child then. Angela thoroughly enjoyed the play, especially the acting, and what was for her undoubtedly the more personally relevant subject matter. I’m convinced though that this play will appeal to people of every ethnicity and religious background, I don’t think it will offend Hindus or Muslims, Indians, Pakistanis or anyone else. Letters to My Grandma in spite of its lasting only 45 minutes manages to touch on a wide variety of themes, from racial and religious intolerance, to the hope for a better life in “the new world”, something all immigrants whether from Europe, Asia or Africa undoubtedly at some point felt. This is actually a reworking of Letters to My Grandma, it was first performed by Anusree in March of 2009, for a review of its first incarnation click here. -$15 Preview & Matinees(advance), $25 Tuesday – Thursday, $30 Friday – Saturday Saturday Matinees PWYC At the door.